CHAPEL HILL, N.C. - Tomorrow Blue Cross and Blue Shield of North Carolina (BCBSNC) celebrates 75 years of service in North Carolina. In honor of the state's largest and oldest health insurer's anniversary, Gov. Easley issued a proclamation that Aug. 7, 2008 be 'Blue Cross and Blue Shield' day in North Carolina. The proclamation recognizes that "BCBSNC has played an integral and leading role in meeting the health care needs of the citizens of this state by delivering quality health care products, information and services to help their well being." "After a successful 75 years, we have a lot to look back on with pride," said Bob Greczyn, BCBSNC president and CEO. "From our modest beginnings offering hospital coverage, we have expanded our services to pay for physician visits, administer government programs and prescription drugs. More recently, we have led the way in offering benefits to cover obesity as a primary health condition. We are working harder than ever to help our customers improve their health and well-being - particularly the one in three North Carolinians who depend on BCBSNC for their health coverage," added Greczyn. The Raleigh Chamber of Commerce also congratulated BCBSNC through a resolution issued in July. The resolution commends BCBSNC for its long history of service to the people of North Carolina, its quality health care at competitive prices, community involvement, efforts to promote sustainability and for being a top employer in the state. To celebrate the company's rich history, BCBSNC captured one of the North Carolina Museum of History's longest-running and most popular exhibits, 'Health and Healing Experiences in North Carolina' in an interactive online experience. The exhibit has been transformed into a dynamic and interactive timeline accessible at nchealthandhealing.com. The site launched in January and chronicles the health issues and practices of the Tar Heel state from the use of primitive herbal remedies to high-tech breakthroughs in modern medicine. 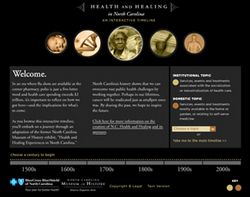 Site visitors can learn about a wide variety of health topics, view photos depicting historical events, watch informative videos and listen to personal historical accounts from fellow North Carolinians. The Web site preserves a piece of North Carolina's history and is a gift from BCBSNC to the people if its home state. BCBSNC is also giving back to North Carolina by donating copies of its commemorative history book, Crossing the Centuries, Committed to Care to public libraries across the state. The book is written by Diana J. Newton and tells BCBSNC's rich history from 1933 to 2008 through the lens of health care evolution in North Carolina. "A lot has changed since 1933, but one thing has remained constant - our commitment to our customers and to making our state a healthier place to live," said Greczyn. Blue Cross and Blue Shield of North Carolina is a leader in delivering innovative health care products, services and information to more than 3.7 million members, including approximately 904,000 served on behalf of other Blue Plans. For 75 years, the company has served its customers by offering health insurance at a competitive price and has served the people of North Carolina through support of community organizations, programs and events that promote good health. Blue Cross and Blue Shield of North Carolina is an independent licensee of the Blue Cross and Blue Shield Association. Access BCBSNC online at bcbsnc.com. Footnote: (1) Newton, D. (2007). Crossing the Centuries, Committed to Care. Blue Cross and Blue Shield of North Carolina. Note: Further documentation and information about BCBSNC's history can be found online at bcbsnc.com and click on the 75th Anniversary page to view video, read chapters from the history book and connect to the interactive timeline.